Our newest addition till 2016 is o sole mio an image of renaissance venice. Unfortunately we had no choice but to leave the canale grande out and just create the interior of a palazzo. Elaborate covings and pilasters, handcarved window and door surroundings, neo gothic mirrors – all in silver and black with a marbled tiled floor and not last a victorian bath tub freestanding in the room as well as a shower ensuite wich i designed. This is a junior suite to die for. 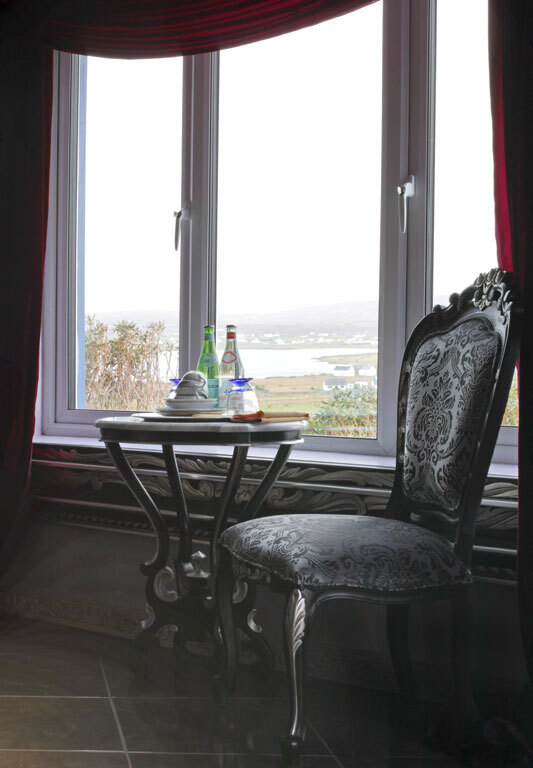 Stunning views over to Keel beach the lake and much more are a welcome addition. It has its own entrance and a chaise indulges to unwind and relax in this sumptuous palazzo. Can you hear in the distance the gondoliere singing? Maybe not but if you are lucky you can hear somtimes somebody in the distance playing the pipe. All furnitures have been handcarved and some of them have been designed by me. A merchant not from venice but at a merchant we found everything to make this a truthful image of a palazzo. Venice has played a major role in trade throughout several centuries until it became a part of what is today known Italy. The palaces and houses in Venice are kept in sumptuous highly decorated interior which still can be seen today. Have a look at the main accommodation-page for rates.